How is VR implemented in the casino industry? Did you know in 2016 land-based casinos globally had a gross win of around $450 billion dollars? It is a huge business that has spread all over the world and much more vehemently in the United States. There are some parallels in how traditional gamblers view online gaming and casino gaming through VR. They view it as something which distorts the complete gambling experience which is derived from traditional gambling. 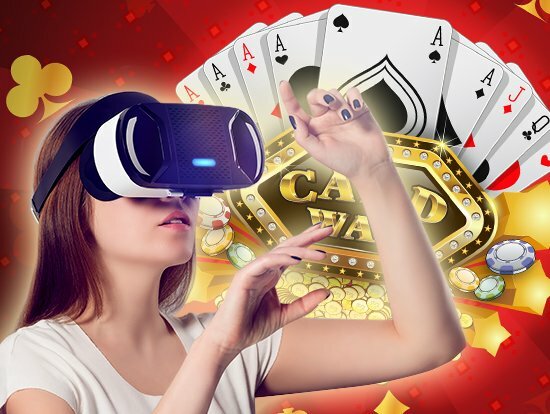 But the reality is that online gaming has offered a vivid experience for gambling enthusiasts and there is no reason why VR in casino can’t be even more fun. The use of good graphics and sound has made online casino gaming gain much traction. In VR, dealers look very real as typical of VR devices. These games offer high paying progressive slots coupled with table games. Playing casino games through VR is a budding trend and if this excitement holds then this trend is sure to expand. Addictive combination – Good games are naturally addictive and VR has been known to provide a highly engaging real-world experience of virtual phenomena. So the combination of either of them will result in a condition which will leave the players hooked to the VR casino games. Gamified VR solutions are engaging even when the simulation is about a boring real-world industry or something similar. Hence gaming and VR is a good combination. VR may bring out a large variety of games – Previously game developers didn’t use to even consider creating VR games due to the uncertainty. Now as VR is gaining ground and looks very promising with more and more VR applications are being developed. Goldman Sachs estimates that the VR industry will generate more than the TV industry in the next 10 years. VR gaming gives the most vivid experience – These games are doing good in all the sectors of the gaming industry. Traditionalists were wrong to assert that VR casino gaming will give an inferior experience. In fact, it has amplified the excitement of those who played the game. It is said that the 3d sound has an especially engaging effect on those who are playing the game. VR gaming is interactive – Online games, on the other hand, are boring to play after one plays for a while. In stark contrast to online casino games, VR casino games have turned out to be highly interactive. They can interact with other players and the experience almost borders on the real life like experience. Device cost – High VR device price usually kept VR enthusiasts at bay from trying out the device. But as the usage increases prices will dwindle down and it is already happening. This has in a way increased consumption of VR casino games among the masses. The prediction by Goldman Sachs needs to be taken seriously which expounds upon the importance of the VR technology. Those who leverage this market gap can do good for themselves. Las Vegas may lose a part of its revenue to California if casino VR games become that popular. There would be no need of visiting Las Vegas if you’re equipped with the high tech VR gadgets from the Silicon Valley. One can realize the grandeur of the casino and the excitement of the game all the while sitting in his home. Juego Studios is a pioneer in employing emerging technologies to further its mission. VR in real estate, VR in industrial simulations; you name it and we are there. If you want to develop a VR application then just come to us with your idea. Our product will be such that your customers’ jaws will drop in awe when they experience it through an HMD. From educational VR games to apps like Tiltbrush that allow learners to explore and perform activities in new ways, there has been some exploration in using reality technologies for learning.